Magnetic swirls called skyrmions are considered to be a promising potential means of achieving more efficient data storage technology and are currently the subject of intense research. Scientists have now discovered a method to generate such skyrmions in a way which can be directly integrated into memory chips and which functions reliably up to the gigahertz range. Using current pulses, the researchers generated nanoswirls at predetermined positions and then moved them in a controlled way. At DESY, they used X-ray holography to image and directly observe the skyrmions. The researchers from Max Born Institute for Nonlinear Optics and Short Pulse Spectroscopy (MBI), Massachusetts Institute of Technology (MIT), as well as other German research institutions reported their findings in Nature Nanotechnology. The scientists generated the skyrmions in a sandwich structure consisting of platinum, magnesium oxide, and a magnetic alloy consisting of cobalt, iron, and boron. Dr. Felix Büttner from MIT explains: "Due to the spin Hall effect, which has its roots in quantum mechanics, and a particular interaction of the atoms at the interfaces between the materials, skyrmions can be generated via pulses of electrical current. With our method, this can be realized directly in so-called racetrack structures at positions that we can determine in advance, which is of course essential for writing data in a controlled manner." These racetrack structures are nanometer-thin wires consisting of stacks of magnetic materials. The scientists controlled the exact position where the magnetic swirls were generated by adding a small constriction in the racetrack wire. At DESY&apos;s brilliant X-ray source PETRA III in Hamburg the scientists have used X-ray radiation to establish that such special skyrmion magnetic swirls were indeed generated and moved along the racetrack wire via current pulses. "X-ray holography is an extremely sensitive method for detecting these very small magnetic structures. The magnetic swirls can be imaged with a resolution of about 20 nanometers", explains Dr. Bastian Pfau from the MBI team. In their investigations, the researchers were able to observe how skyrmions were generated with single current pulses and were then subsequently moved along the racetrack wire with additional pulses. The study was concerned with understanding the fundamental mechanisms underlying these processes: What happens in the few-nanometer-thin layers of material and at their interfaces in particular when single current pulses with a duration in the range of nanoseconds are sent through the wire? During the current pulses, how do electrons from the platinum layer influence the magnetization in the adjacent cobalt alloy so that skyrmions with a particular rotation direction are generated? Towards this end, the team compared the experimental observations to micromagnetic computer simulations, which emulate these processes. "The insight into the microscopic mechanism will significantly help us to improve the concepts and materials for future data storage technologies", says Büttner. "Our data is in the cloud" - when we say that, we often forget that ultimately the data reside on hard disk drives in the large data centers of companies like Google or Facebook. 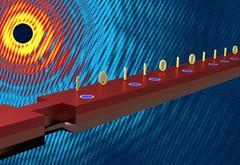 The single bits of data are encoded in the magnetization of thin magnetic films. A mechanically moving read/write head uses magnetic field pulses to write the bits onto a fast-rotating magnetic disk, the actual hard disk. To be able to store more data in the same volume in the future, scientists are working on transitioning from this inherently two-dimensional concept to a three-dimensional storage approach. In such racetrack memory devices, the information is also encoded in magnetization patterns, but now in a wire-like structure. There, they can be moved back and forth very quickly along this wire - aptly dubbed the "racetrack" - to be stored or retrieved. In contrast to today&apos;s hard disk technology, this can happen without using any moving mechanical parts, solely by applying very short current pulses. As the racetrack wires can be packed tightly together in three dimensions like a bunch of many parallel straws, this concept enables high data storage densities. One candidate for representing the single bits in these racetracks are the nanometer-small swirls of magnetization, the skyrmions. Researchers are fascinated by them, as they can be moved with electrical current, while they are very stable at the same time. The presence or absence of a skyrmion would represent the bits "1" and "0" in this technology. So far, quite complex setups have been required to generate single skyrmions in a controlled manner - in contrast to the newly reported approach, which thus opens new perspectives for data storage technology.